http://media.blubrry.com/proudlyresents/p/proudlyresents.com/media/prp133.mp3Podcast: Download | EmbedSubscribe: Android | Google Podcasts | RSSNicko & I take a bite out of the best bad shark films, ever. Excluding Jaws and Sharknado. We dig deep and find the best of the worst movies about killer sharks. 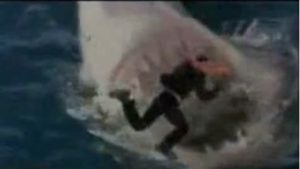 Nicko reveals the unknown “Jaws 5” AKA “Cruel Jaws” which she describes as “very unofficial.” These films are so bad, your Jaws will drop. Of course we missed a few. Tell us here or on our Facebook page. Listen to the podcast! Or watch it here.